Sometimes it helps to have the artist's view to understand the work itself. This page will highlight specific works and give some information into my thoughts while creating it. This piece combines elements of 2-D and 3-D work in one kinetic work of art. 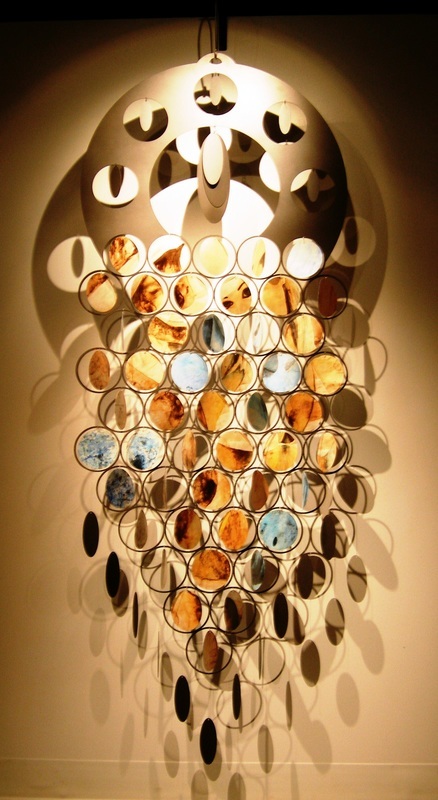 The frame of this piece is designed to represent a giant earring. The idea behind a piece of jewelry has a few significant symbolic representations. First, a piece of jewelry is something worn to adorn the body, to make oneself more alluring. Second, women tend to pass down special pieces of jewelry as heirlooms to their daughters and granddaughters. 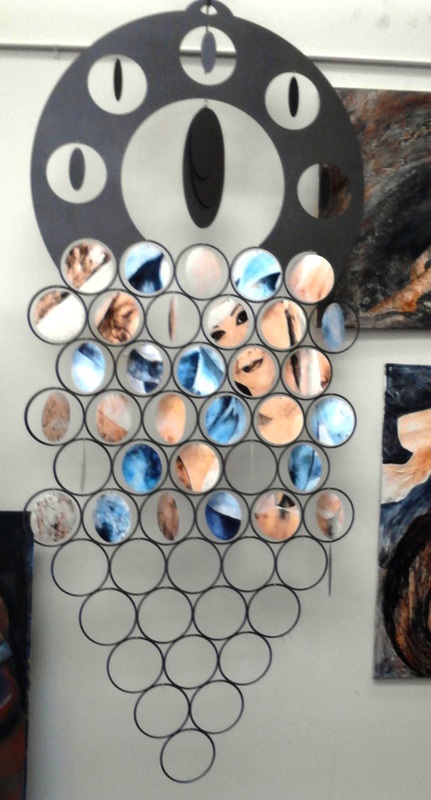 The frame of this piece is made of steel; a metal that represents strength and often times masculinity. The circles within the frame are paper covered in vinyl. We often do not associate paper with strength, rather fragility. This work started with a six foot painting of a young attractive female. It was then cut into circles and replicated in cool colors on the reverse side, then reassembled into the frame. The pieces spin with the airflow in the room....so in essence... as we all are affected by our surroundings, the surroundings in the room affect this kinetic work. 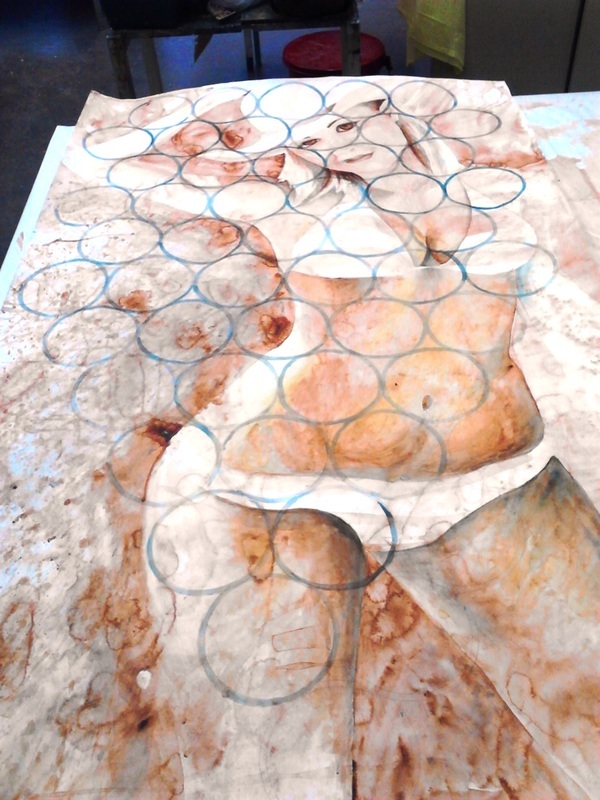 This is the six foot watercolor painting before it was cut into circles. The dissection of the painting abstracts the view of the image considerable and one has to really look at the image to realize they are looking at a human form. As with many of my MFA works this cutting apart of the image is symbolic of the world tearing others apart. Then each piece is reassembled representing the strength of the individual to rise above, put themselves back together, and become the unique and beautiful individual they are. 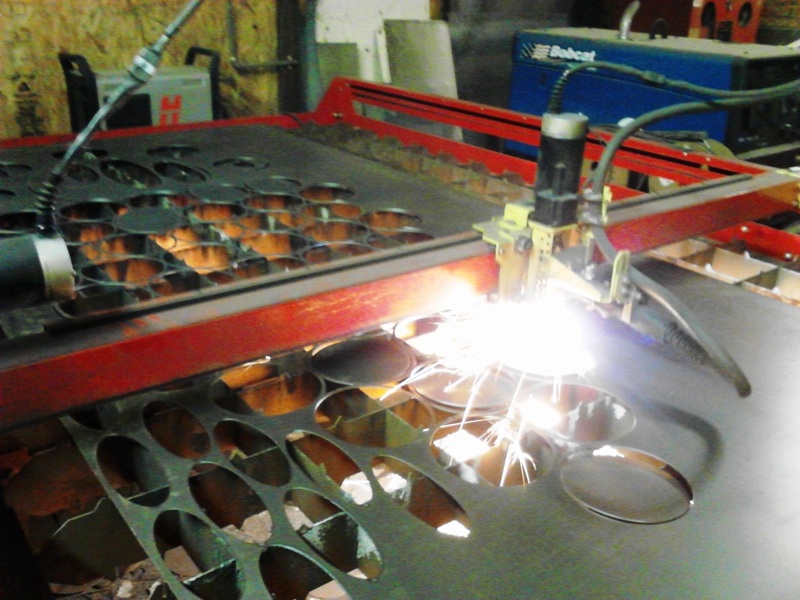 I am fortunate to have access to a Plasma cam cutting system. Any design can be translated into a cutting path with a special computer program which then operates a plasma torch to cut the design. As with many artists, I did have to have help with this portion of the work.